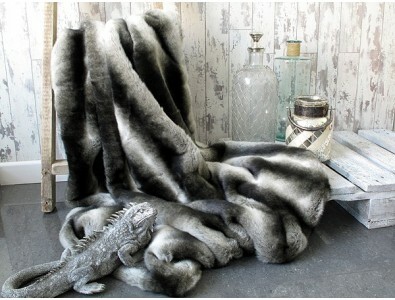 The medium length faux fur throws that we manufacture and offer for sale cover plain and patterned designs. Some are striped, some animal print, and some completely plain. Whatever your choice they represent excellent value for money and are some of the most luxurious faux fur throws and blankets you will find anywhere. Dense fur make this group of throws not only very warm, but stylish and sheer luxury. They can be used in most applications; for bedroom throws and bedspreads, sofa and chair throws or blankets for your pets. Mid-beige, with additional stripes of off-white and taupe spots, this medium length faux fur throw oozes style and luxury. A warm, dense, soft fur. Our Black Wolf faux fur throw comprises black and grey fur in a striped design. Very competitively priced and ideal for many situations. A medium length faux fur. An easily maintained faux wolf fur throw or wolf fur blanket. Our Grey Wolf faux fur throw is an economically priced, some would say cheap, sofa throw or bed throw. Medium length fur with greys, browns and tan. Easy to maintain. Looking for cheap faux fur throws? This Italian Wolf design is low priced and yet a luxurious looking faux fur throw. A combination of white, brown and tan fur makes this an unusual and eyecatching striped design. A medium length fur.